HomeReviewFairy Tail Review – Great Mages Belong to Popular Guild and Perform Quests	No ratings yet. Fairy Tail is actually one of the most famous shounen anime out there and if you’re considering watching it based on this reality alone, then I persuade you to read some reviews first. Not only in Anime Bibly, but also in other anime forums and sites. And I hope you can keep your egos in tact if you’ve decided to read my review. I have my own reasons to love or not an anime. What is Fairy Tail anime? Before you continue reading my review here, I think I have to warn you that if you are a huge fan that can not take any criticism, please stay away from reading this review and consider that this is never existed. Especially if you are a someone who belong to a community who’s always saying “just make your own anime“, you will never like this post. You have been warned, friends! But if you’re a big fan of this series, maybe you’re interested in Fairy Tail merchandise? We picked them for you! 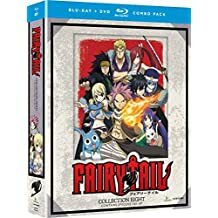 Fairy Tail is a Japanese action, adventure, and fantasy anime TV series produced by A-1 Pictures, Satelight, and Bridge with Shinji Ishihara as a director. The anime was broadcast on TV Tokyo‘s TXN and AT-X starting from October 12, 2009 to March 26, 2016 that has 277 episodes in total. Fairy Tail is based on the Japanese manga series written and illustrated by Hiro Mashima of the same name which began serialization in Weekly Shounen Magazine since August 2, 2006. Kodansha collected and published the series into 60 tankoubon volumes as of March 2017. Del Rey Manga and Kodansha Comics USA acts as English publisher in North America. An action and fighting Fairy Tail video game adaptation developed by Konami were available for Playstation Portable and Nintendo DS. The game was first released on June 3, 2010 in Japan and still not available in North America. Funimation licensed the anime in North America and has released several DVD and Blu-ray since 2013. The latest blu-ray released on June 6, 2017 and collection 10 on October 24, 2017. The Kingdom of Fiore, it’s a stable neutral country with a population of 19 million. It is a world filled with magic. Magic is traded like common goods and it has become a part of daily life. And there are people who use magic to make a living. Those people are called “Mages”. Mages belong to various guilds and perform their jobs on request. Countless guilds have been formed in this country and there’s a certain mage guild located in a city. In past times… no, even now, it’s still creating legends… Its name is Fairy Tail. Set in the mystical land of Fiore, magic exists for being a fundamental element of everyday life. A number of magic guilds lie at the center of all magical activity, and assist as venues for like-minded mages to band together and handle quests. Among them, Fairy Tail guild stands out from the rest as a place of strength, spirit, and family. Lucy Heartfilia is a young female mage looking for celestial gate keys, and her dream is to turn into a full-fledged sorcerer by joining this well-known guild. In her way, she encounters Natsu Dragneel and his cat-talking partner Happy, who are on a quest to find Natsu’s foster father, the dragon Igneel. Story is nothing special, nothing has certainly improved or changed since the beginning. This is among the weakest elements of Fairy Tail because it gets daunting and quite boring as there is no real progression, and it gets to be extremely predictable with how it’s going to play out. The comedies are funny for the first 24 episodes but then they get truly old fast along with the fan-service. You could also have a serious battle but contain a comedy touch in the middle that completely damaging the mood for the battle. The animation is okay for a shounen anime because it can be fast paced and most of the magic does really cool. My only complaint is the battle animation, I personally think that it could be a lot better quality. Every single character didn’t change one bit, which means it is really bad as they almost have zero development. You will find a large cast of characters who are static. Every stereotype of this genre are available in this anime, from the standard hotheaded male characters to the nasty villain who gets to be good and changes sides, also most of them stay the same through the entire series which makes this anime much more predictable. Want to bring Fairy Tail to your real life? Then read this Fairy Tail cosplay tutorial! Fairy Tail is missing a lot of fundamental factors and is definitely confused as to what wanted to be. I feel that this anime struggles to balancing comedy and battle scenes because it couldn’t have the gag at the right time. I won’t recommend this anime considering it is fallen to the several cliches and fails to bring anything solid to the audiences.